Initial excitement for Cheshire Yeomanry who early experienced the coastal bombardment of Yarmouth and Zeppelin bombing raids over Norfolk, largely gave way in 1915 to a period of many months with little to report. Zeppelin raids became more common through 1915. There was thought that they were guided by signal lights from land, possibly vehicle head lights. Several times road blocks were set up in an attempt to catch the offending car, but to no avail. No such vehicle was ever seen. 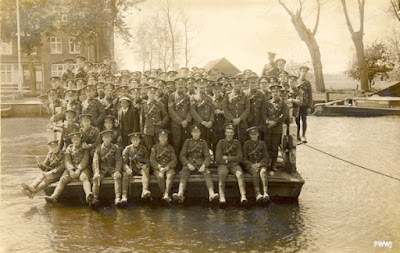 On 5 November 1915 the Cheshire Yeomanry received their orders to go abroad dismounted. All cavalry equipment had to be handed in and changed for infantry. All ranks too, had to be allowed a short visit home to say goodbye to their families. The excitement of being ordered abroad however gave way to doubt and despondency late in November as it appeared that the orders had been cancelled. It is likely that the original intention had been to send the Regiment to Salonika. The Yeomanry continued to do dismounted training and to hope for the best. Air raids also continued and on occasion the Regiment was instructed to be especially vigilant. Whilst threat of enemy raid remained there would be a need for coastal defence, and it seemed the Regiment would never get away. In February 1916 orders were again received that the Regiment were to go abroad. The last parade of the Regiment in Norfolk took place on the evening of 2 March before marching to Lowestoft Station for a journey to Devonport. The following evening the Regiment embarked on board HMT Haverford.